Experience paradise on a daily basis with the heavenly scent of Paradiso from Roberto Cavalli. Exotic citrus notes of mandarin orange and light floral accents of jasmine blend with earthy, woody notes of bergamot and pine to create a natural ambiance that matures as the day goes by. Launched in 2015, this women's fragrance is perfect for carefree summer days shopping outdoors or enjoying a sunset at the beach, surrounding you in the sweet scents of a clear, warm day. 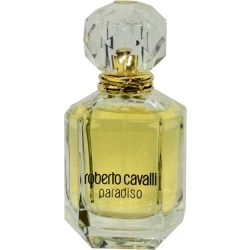 Roberto Cavalli Paradiso, eau de parfum. What can I say, I was introduced to this several years ago and it is my signature fragrance, just adore it. This is a wonderful perfume that lasts for hours. My office mate wore it to work and left trails of this wonderfully heady fragrance everywhere she went in the office. It makes you imagine you are in a tropical paradise with a beach and pool enjoying the sun while sipping an exotic cocktail. It is like going on vacation just wearing it.